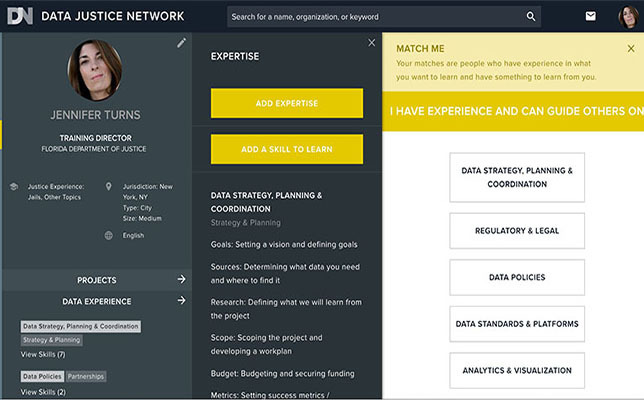 New York University’s Tandon School of Engineering, in partnership with the Governance Lab (GovLab), has launched a “social network” for criminal practitioners and policymakers to collaborate and utilize data to inform decision-making. Track their own knowledge of innovative ways to use data at every stage of the criminal justice process via user profiles. The GovLab is based at NYU Tandon, as well as the MIT Media Lab. The lab designs and tests technology, policy and strategies that “enable open and collaborative problem-solving inside a variety of organizations,” according to its website. The Data Justice Network was built by the GovLab, with support from the Laura and John Arnold Foundation, a philanthropic organization that also utilized data to solve challenges in the criminal justice system, as well as The Justice Management Institute, a Virginia-based nonprofit that provides solutions for advancing knowledge and practice within the administration of justice. The Data Justice Network is now open to criminal justice practitioners and policymakers. Further information is available on the DJN site.